If you suffer from allergies or asthma, this page will give you vital information on options for your indoor air quality. There are a lot of options out there for air purification. We will try to give you the high notes on the most common solutions. First, there is the regular filter we are all familiar with. These are an inch wide and catch the big stuff your blower pulls in. They mainly keep the unit itself clean, and do a reasonable job of filtering the air. The next type is U.V. <Ultraviolet> Lights. 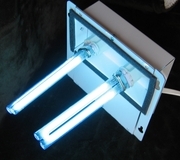 These lights, in conjunction with a media filter, will ensure that the air you breath is as clean as possible. It is installed inside the indoor unit and purifies the air as it cycles through. For people with allergies, asthma, or the elderly, this option will give you outstanding results. If you find your sinuses or skin being dried out during winter, a humidifier is what you will want. The normal heating cycle will naturally remove a certain amount of moisture from the air. Humidifiers are designed to put back that moisture, and keep you comfortable. They are easy to install and we recommend these for anyone who suffers from being dried out. Based in Lakewood, and serving the Long Beach, California area.